A local man has collected evidence of high levels of air pollution in London and is asking the Mayor of London to take radical and urgent action to address the problem in order to improve air quality in the city. John Lenehan was compelled to take action as he suffers from an ongoing cough so he purchased a mask which has a special filter to block harmful air particles and is looking to show people in London just how harmful the air is in their city. He wore a mask with filters around London while cycling and taking the tube and has documented the extent of the pollution in the air. In April, he wore the mask during his commute by bike to and from his workplace for 3 days. 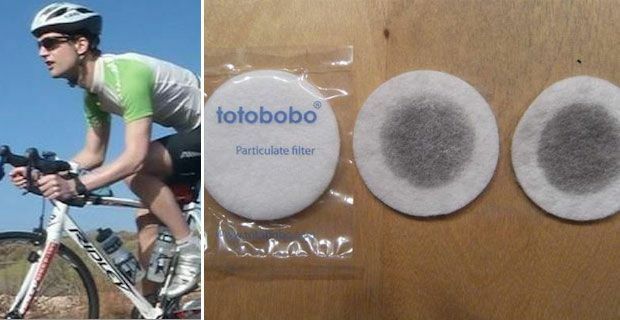 He was appalled at the amount of particles he discovered upon examining the filters which were blackened after use during approximately 4 hours of cycling time. He said "When I was cycling to work, I would be coughing and have a sore throat all the time. The damage I was doing to myself was beyond belief. The cumulative effects of this toxic pollution over a lifetime do not bear thinking about." Mr Lenehan then decided that it was far too dangerous for his health to continue commuting to work by bike. He chose to travel by train instead but retained the mask to see what kind of air quality London commuters have to endure on a daily basis. Again, Mr Lenehan was in shock at the amount of pollution that he found collected on his filter. The final section of his commute was underground and he observed that the air filter he used on the train commute was similarly blackened to the filter he used when cycling. He has since moved outside of London in order to alter his commute and avoid cycling or using public transport on busy routes. Mr Lenehan, a triathlete, is keen to point out that this is not a problem solely for cyclists but rather the poor air quality is affecting everybody in London. He said "It is something that affects everybody, people living and working in London, children, adults and elderly people. As an example, Oxford Street, one of London’s showcase streets, regularly fails air quality tests. It’s no wonder with so many buses and taxis.”"
Mr Lenehan added "You can’t actually see the air pollution and know how bad it is, and I think that people need to know the extent of the problem and the diseases it can cause. Cleaner technologies are available and must be embraced, particularly for buses, taxis and lorries. Congestion must be reduced." The organisation Clean Air in London has also called on Mayor Boris Johnson to tackle the issue by increasing the congestion charge in London and accelerating plans to complete the East-West and North-South Cycle Superhighways. The Mayor has come in for a lot of criticism after announcing plans to spend £28 billion on road improvements until 2050 with only £1 billion of that earmarked for cycling.